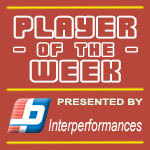 American Gary Jacobs (188-G-92) put on an extraordinary performance in the last round for Hang Tuah and that's him to receive a Interperformances Player of the Week award for round 18. The 26-year old guard had a double-double of 36 points and eleven rebounds, while his team beat Pacific Caesar (#4, 4-9) 83-76. Hang Tuah maintains the 4th position in their group in Indonesian IBL. Hang Tuah is a typical solid league team placed somewhere in the middle or a little bit lower in the standings. They need more victories to improve their 6-7 record. In the team's last game Jacobs had a remarkable 72.2% from 2-point range. He turned to be Hang Tuah's top player in his first season with the team. Gary Jacobs averages this season 23.0ppg, 8.2rpg and 5.4apg. Worth to mention Jacobs played also at Eurobasket Summer League, which helped him get the job in pro basketball. The second most remarkable performance in last round's games was 31-year old American forward Dior Lowhorn (201-F-87) of second-ranked Satria Muda. Lowhorn impressed basketball fans with a double-double of 33 points and 16 rebounds. Of course Satria Muda cruised to a 88-80 relatively comfortable win over the lower-ranked Satya Wacana (#5, 4-10). This victory allowed Satria Muda to move up to second position in White Group. His team's 7-6 record is not bad at all. Lowhorn is well-known by Satria Muda fans and he already established his position as one of team's most reliable players. 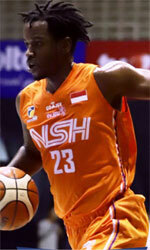 The third best performed player last round was American Madarious Gibbs (185-G-93) of Satya Wacana (#5). Gibbs got into 30-points club by scoring 41 points in the last round. He went also for six rebounds and ten assists. Despite Gibbs' great performance Satya Wacana lost 80-88 to the higher-ranked Satria Muda (#2, 7-6). But his team cannot count on just a single shooter as he also needs help of the other teammates. Satya Wacana can only dream about fighting for top spots in White Group. They have rather bad season and 4-10 record places them close to the bottom of the standings. Too bad for Gibbs he does not play for a better team. But maybe if he did, his season stats would not be that high. Gibbs has a very solid season. In 2 games in Indonesia he scored 22.5ppg.